There is something about a tree house that manages to capture and charm everyone from young children to adults. It can be a hideaway, a secret fort, or an escape from the rest of the world. Building a tree house is a fairly involved project and does take a significant amount of supplies and labor. There are also safety issues to consider. Just about any parent will initially have fears that the structure isn’t sturdy enough or that kids may accidentally fall. 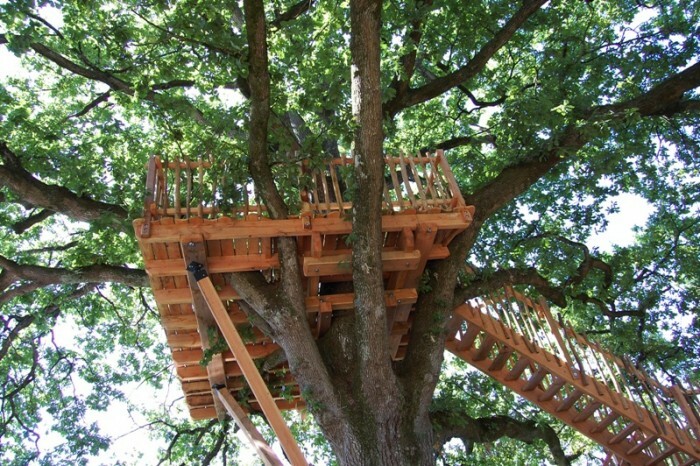 By planning and designing properly, people can ensure a strong, stable tree house. In some areas, people require a permit for building structures above ground level. There are also concerns that neighbors may complain if the tree house makes it easy to see into their homes. Find out about any legal aspects for your city before starting to build. The next step is to find a suitable location for the tree house. Look for trees with large, spread out branches. In general, a tree house built at a low level is best for families with young children. The tree should be strong enough to support the additional weight of the tree house. Ideally, they should be away from power lines and offer some shelter above by way of branches and leaves. Sketch out a plan and include accurate measurements to ensure that the tree house is well-built. With the plans in hand, ask a hardware store to cut lengths of lumber to the sizes required. While there are many types of wood available, pre-treated pine is best since it is light weight and unattractive to bugs. Some essential tools include a ladder, pencils, measuring tape, fasteners, rope, nails, bolts, saws, a drill, and a nail gun. Additional items such as safety goggles, gloves, and a first aid kit are useful for personal safety. The first stage of constructing a tree house is to build a platform. During the entire construction process, it is highly recommended to take a free-form approach and build around the tree’s living parts. This method avoids harming the tree and encourages it to continue growing. When creating the platform, feel free to cut out holes to allow it to fit around limbs and branches. In general, lashing the planks with rope or using fasteners are the best way to avoid harming the tree. Only use a drill or nail gun as a last resort. It is useful to research different types of knots so that the strongest, most durable ones can be used to attach the planks. Also beware of tying rope too tightly as it can cause harm to the tree. The best method is to bolt boards on top of existing branches to add extra support to the platform. Since it can be tricky to build in a tree, a method that many people use is to construct parts of the tree house on the ground and then attach it to the platform. This works well for walls and the roof. Don’t forget to leave extra spaces for an entry way and windows. Although many tree houses feature a ladder, installing a couple of small lower platforms (similar to those in children’s playground structures) with railings will allow children to climb up and down with less risk of falling. Before officially opening the tree house for use, go through it and check carefully for hazards such as unsanded planks and nails sticking out. It is a good idea to stay in the tree house for some time during rainy weather to check for leaks in the roof. The final part of the tree house construction is likely the most fun and one where kids can be involved safely. Think about different types of accessories that might make the tree house more interactive. For example, rope swings, a trap door, or a fire pole are some fun ways to let kids enter and exit the tree house. Other items like a flag, a homemade periscope or spy glass, and a garden hose as a water cannon will help them ward off imaginary enemies. Inside, the tree house could be decorated with cushions, cloth drapes, a little table, posters, and a chest of toys or costumes. The outside might be decorated with paint or solar-powered garden lights. Ask the kids to brainstorm a theme for their tree house and then help them to implement it with decorations.